After work I went home and got the camera and headed to the Santa Ana Train Station. 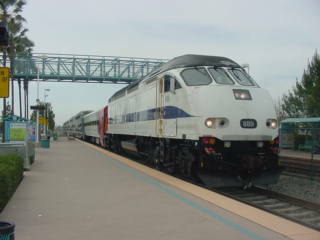 I had a Santa Ana to Irvine Amtrak ticket that I needed to use for the Triple Guest Reward Point. 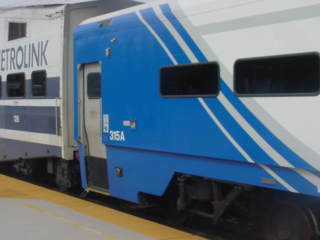 As Surfliner 578 arrived into the station, Amtrak CEO Joseph Boardman got off, said hello to him before I boarded for the nine minute trip to Irvine. 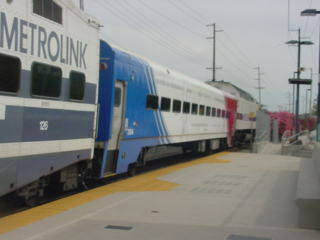 There I bought my Metrolink Tickets and went out to the Irvine Station Platform to wait. The train was running late with their Electronic Message sending this to the passengers waiting. Later I saw a headlight and something didn't look like right when the train came into view. 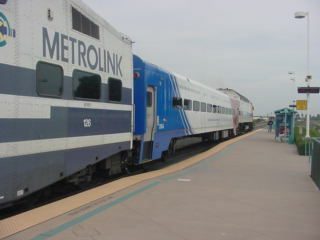 Once I saw what was different about this Metrolink Train, I was extremely happy. 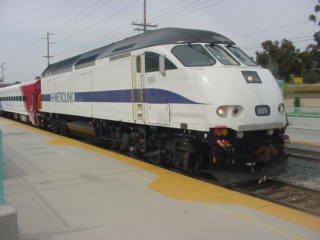 Metrolink 684 arrived in Irvine twenty minutes late with a Comet Car in its consist. 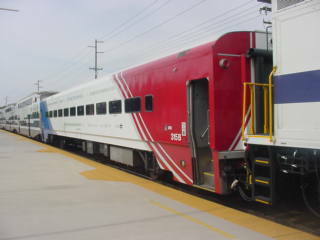 The UTA 315 Comet Car that I boarded at Irvine for my trip to Laguna Niguel then home to Santa Ana. 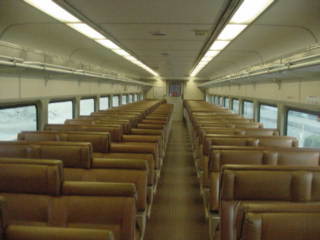 Looking from the A End of the Car to the B End of the UTA 315 Comet Car. 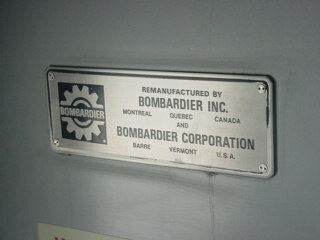 The B End of the UTA 315 Comet Car. 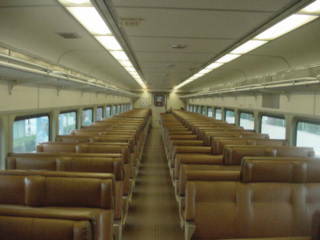 Looking from the B End towards the A End of the UTA 315 Comet Car. 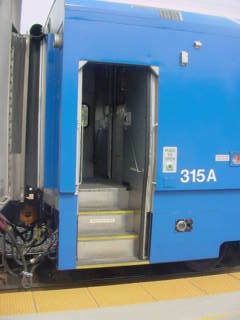 The A End of the UTA 315 Comet Car. 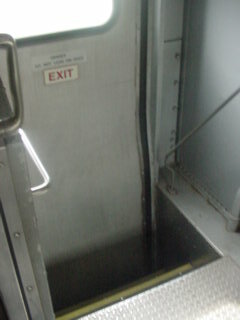 The door closed and passengers are not to be in the vestibule while the train is in motion. Both doors open at all station stops. 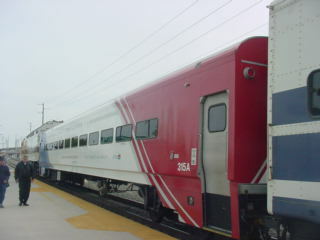 Another view of the UTA 315 Comet Car. One of Metrolinks newest engine on this train. 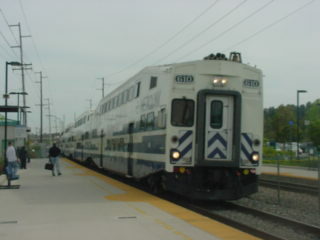 Metrolink 684 at Laguna Niguel. 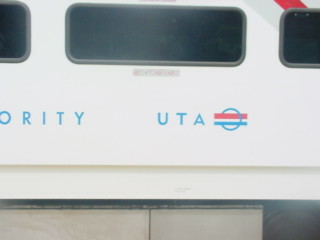 The Utah Transit Authority Emblem. 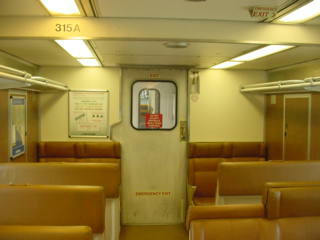 The doors are now closed as the train prepares to leave Laguna Niguel. Metrolink 684 left Laguna Niguel for CP Avery where it would switch tracks and come back into Laguna Niguel as Metrolink 804. 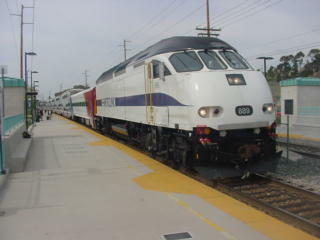 Metrolink 804 came back into the Laguna Niguel/Mission Viejo Station. Two views of the UTA 315 Comet Coach. 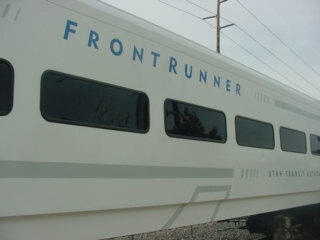 The Front Runner name on the car. 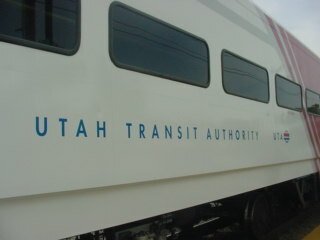 The Utah Transit Authority Lettering on the car. 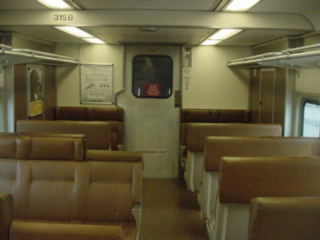 I boarded the UTA 315 for the trip back to Santa Ana. 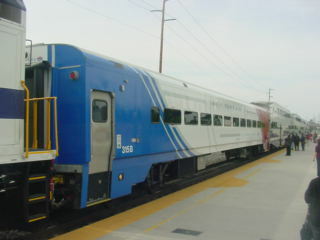 It was interesting to see the Metrolink Riders faces when they boarded at Irvine and Tustin. 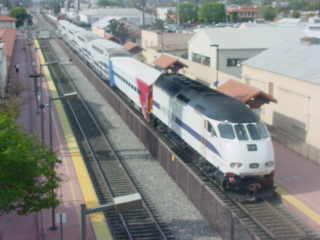 After detraining I went up on the bridge at Santa Ana where I set up for a picture from above of the train and the Utah Comet Car. 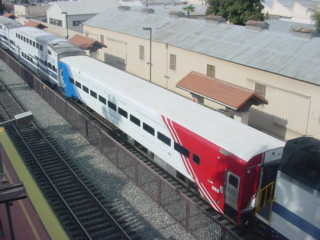 Metrolink 804 leaves Santa Ana heading to San Bernardino. I headed home to write this story before going to the Orange County Railroad Historical Society Meeting where these pictures would be included in my program tonight.